Citi FM, in partnership with GTP, presents Expressions of Accra 2013, themed ‘Creative Explosion’. Expressions of Accra (Creative Explosion) stands out from all other fashion shows in that it goes beyond the runway, taking its audience on a ride to a whole new world of fashion and creativity. Expressions of Accra – Creative Explosion is not simply a fashion event but a show that seeks to unearth the Unusual, the new and the Outrageous. It is about originality, expressiveness and imagination! All of these are going to be expressed through the various performances on the night including drama, musical and spoken word performances, comedy and of course the explosive designs on the runway rolled into one wholesome package! This event, which is in its second year, is to be launched on Friday October 11, 2013 at 6pm at the forecourt of Citi FM in Adabraka Accra. Expressions of Accra – Creative Explosion is sponsored by GTP Nustyle, HFC Bank and Supported by Sleek Cosmetics, Fashion GH, Exopa Modeling Agency and La Palm Royal Beach Hotel with make-up by Renee Q. Media partners are eTV, B&FT, TV Africa, Viasat 1, Daily Heritage, The Weekend Finder, Daily Guide, The Weekend Globe and citifmonline.com. 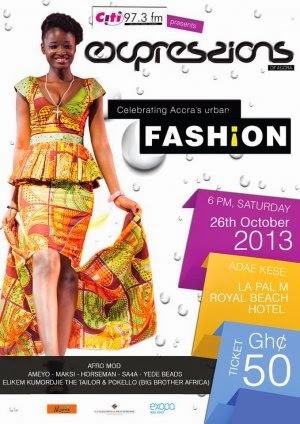 Expressions of Accra, celebrating Accra’s Urban Fashion.